The Sentiment Analysis integrates part of the functionality provided by the Sentiment Analysis API. It provides two levels of analysis to the user: a global, more general sentiment analysis of the whole text and a feature level analysis, where entities and concepts are extracted and their aggregated polarity in the text is obtained. We can see there are two areas in the interface: Input, which we have already covered in the corresponding section, and Analysis Settings. Language, to select the language of the texts. By default, the language set as preferred in the General Settings will be preselected. The possible values are: Spanish, English, French, Catalan, Portuguese and Italian as well as the languages included in the Nordic pack, Danish, Swedish, Norwegian and Finnish. Model, with the model that will be used to measure the sentiment of the texts. The models listed are determined by the language selected in the previous menu. Currently, the only model available for English, Spanish and French is General but all the languages support user sentiment models defined in the sentiment models customization console with the user with the key configured in the addin. If no models are listed for the selected language, then you may not have access to any models for it. If it's a language that belongs to a language pack, make sure you have access to that pack! 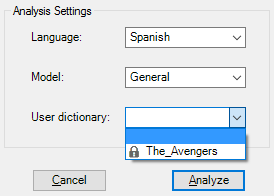 User dictionary, to select if you want to use one of your user dictionaries in the analysis. The dictionaries that will appear in this menu are the ones created through the dictionaries customization console with the user with the key configured in the addin. Document, to extract the global sentiment analysis of a text. Topics, to extract the topics of a text and find the polarity associated to each one of them. 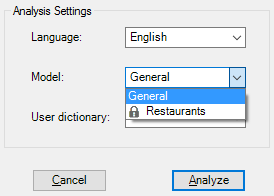 Both analyses are independent from each other and are selected by default. Agreement: shows the agreement between the polarities detected in the text. Subjectivity: shows the subjectivity value obtained for the text. Confidence: shows the confidence value associated to the polarity detected for the text. Irony: shows if the text is considered ironic. Form: with the name by which the topic extracted is identified. It's non-configurable, so it always appears in the results. Topic category: shows the type of topic extracted, that is, if it's an entity or a concept. Rank: contains the order in which the topics have been detected. It's specific for each type of topic, that is, the first entity detected will be ranked 1, and the first concept will be ranked 1 too. Type: shows the type associated to the topic according to our ontology. Polarity: shows the polarity tag obtained for the topic. It behaves the same way as the polarity tag we've shown for Document Analysis. Sense ID: shows the ID of the topic detected. the document-level analysis will be displayed in a sheet called "Global Sentiment Analysis". the feature-level analysis in a sheet called "Topics Sentiment Analysis". 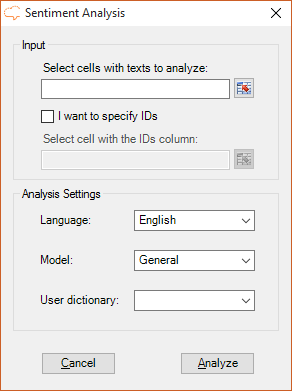 This means that if both analyses are configured, Sentiment Analysis will result in two new Excel sheets. Both sheets will include a column with the source text, a column with the IDs if enabled, and then a column for each one of the output fields configured in the advanced settings. 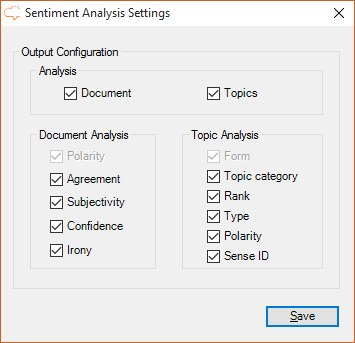 The following example will show a possible output of the sentiment analysis at a feature level, which will show the topics found in the text analyzed and also if each of those topics has a polarity associated. The analysis of the example has been carried out over a theater review in English, using the General model, and setting all the possible fields available to be shown in the output. In this case, we have not selected IDs in the input. You can see in the image how each new topic found for a text is inserted in a new row, combining the cell where the text would go with the one that already contains it, letting you know easily from which text that topic has been extracted without the need to repeat it.